Last year the prickly pear cactus on my trails had lots of fruit and my person decided to get brave and pick some and make things that were good to eat. This year the prickly pear only had a few puny flowers so I don’t think there’s going to be much fruit. 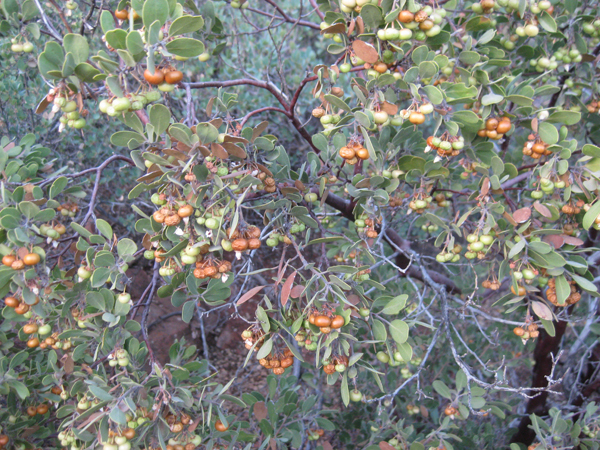 But the Manzanita bushes are loaded with berries. And my person decided she was going to experiment with those this year. Of course she didn’t ask me first. Most of those berries are really little and it took a long time to pick enough to do anything with. Hey person, all the best berries are in here. I tried to help, but my person told me to sit and be quiet. We picked up a hitchhiker while my person was picking. Finally my person was ready to head home. I got accused of getting her backpack wet. I’m always getting blamed for things and this time I couldn’t even put the blame on Scratchy. It turned out my person had a leaky water bottle. Whew! Off the hook that time. When we got home I still had to sit and be quiet. My person wasn’t finished with those berries. I may have gotten off the hook for getting my person’s backpack wet, but I sure hope I don’t get accused of watering the inside of that jar. Poor Bongo, always getting blamed for one thing or another. Now since I’ve never heard of these berries, what exactly is that in the bottle? Lola and Diane, it’s really berry cider in the bottle. She poured boiling water on the berries, soaked them, crushed them, let them sit overnight, and ran the cider through cheesecloth to get out all the berry residue. She says it tastes kind of strange, but it’s not too bad if you sweeten it a little. I think she might try making ice cream with some of the cider next. I hope. Oh, poor Bongo we knew you couldn’t have been the one to wet the backpack. Is that juice extracted from those berries? It is the perfect color of something you could be blamed for but if that happens…remind your person you have no thumbs so you couldn’t get that lid on and off the jar. Hugs and nose kisses sweet Bongo! 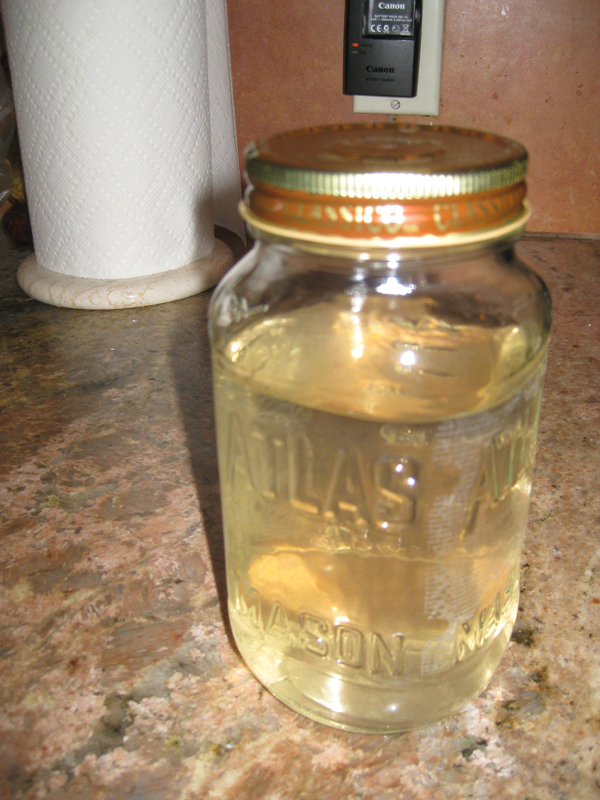 Chancy and Mumsy, I actually didn’t get blamed for the stuff in the jar. 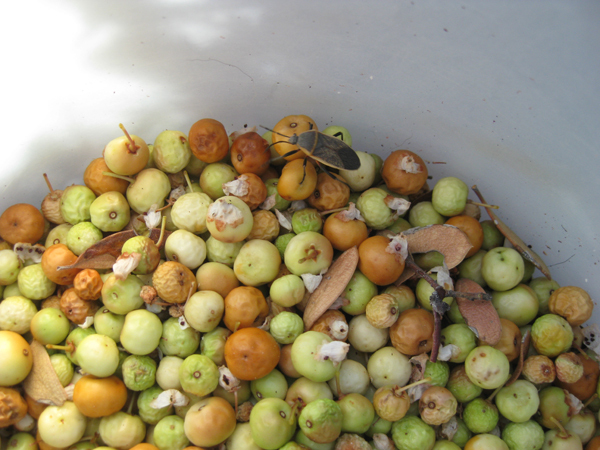 It is from the berries, but they’re really dry and don’t have much juice so there’s a lot of water added. I’m curious, what did you do with the berries and what is the liquid? 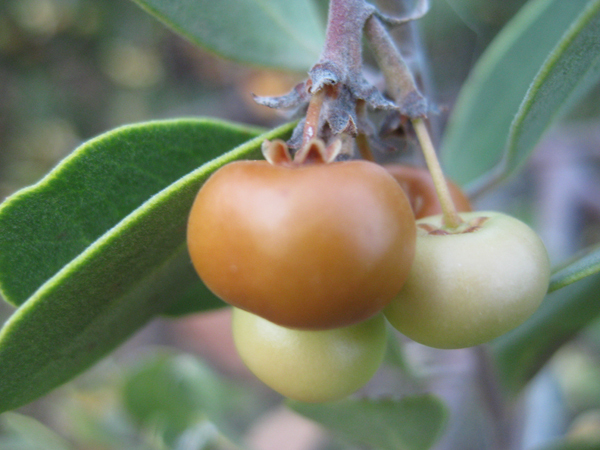 Susan, my person found out how to make manzanita cider from this website. 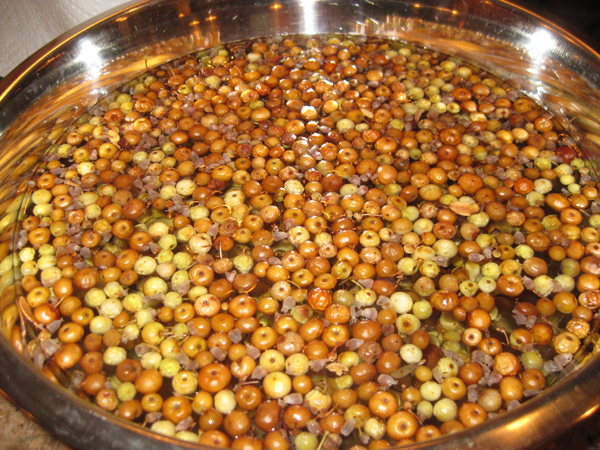 http://honest-food.net/2010/08/22/manzanita-cider/ The liquid comes from soaking the berries in water and then straining the berries out of it. Benny & Lily, it seemed like my person was picking berries forever to get that many. There are still tons more on my trails. Gizmo, my person says she likes picking raspberries better because it goes faster, but raspberries don’t grow much around here because it’s too dry. 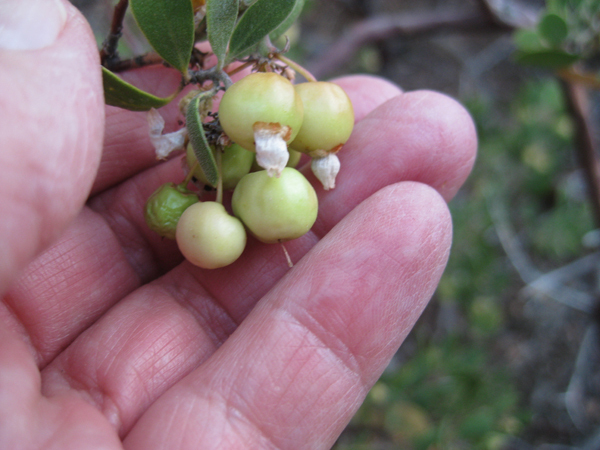 My person looked on the web and found out the berries are edible but they don’t taste good so she found a recipe for manzanita cider – or you could call it tea. You steep the berries in boiling water and leave them overnight and then strain off the berries. Cupcake, that’s what it is for sure. My person says she’s having to get used to the taste though. Bongo – just don’t get near that jar. It’s so hard to be patient all day long. Maybe you’ll get some extra loves now that that’s berry done? Karen, I’m hoping my person will find something better to pick next time. 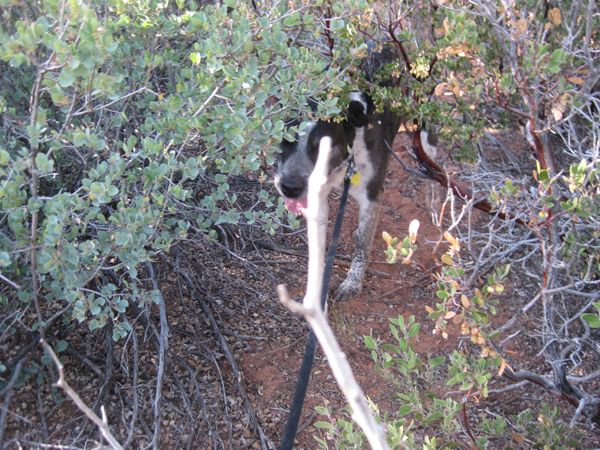 There’s got to be some dog treat trees around here somewhere. Hmm, this looks like a nutritious and healthy drink, but I don’t know what it is! 🙂 Did you get to taste any of those berries? Marina, those berries don’t smell like anything I’d want to eat so I didn’t even try. I’m still holding out for the fish. Kevin, my person says that berry drink tastes kind of strange and she’s not sure how to describe it. Sort of a woodsy flavor. She’s having to get used to it. She doesn’t usually sweeten her drinks but she says this is much better sweetened. I think the berries by themselves are supposed to taste really bad. We didn’t try them. Are those sweet berries? Looks like nectar in a jar! Misty Shores, my person read that the berries are full of tannin, and taste really bitter. We didn’t try them. The juice my person made needs to be sweetened before it tastes okay. She had to add a lot of water to make the juice because the berries are really dry on their own. Berry honey? Is it sweet? If you knock it down with your tail (by chance, of course), you can blame Scratchy! Kolytyi, it’s not sweet on its own. My person has to put sweetener in it before it tastes good. But I’ll make sure to blame Scratchy if I knock it over. Sometimes he gets on the counter and knocks things off. Little Binky, my person made ice cream with it too. That was the best. THose look good. Branwen used to eat wild berries on our collie walks. Now she just waits for us to pick them and give them to her…. Collies and Chuck, those berries look better than they taste – but the cider made out of them was pretty good.